A Railway Safety System Exists. So, Why Wasn't It Implemented? In light of recent train wrecks, many are wondering when a full installation of a railway safety system called positive train control will be done. 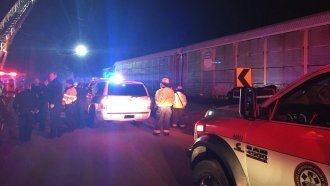 Federal transportation officials are investigating the deadly train crash in South Carolina that killed two people and injured more than 100. It's the third crash of its kind in the past seven weeks, and experts say the latest wreck could've been prevented with a specific railway safety system. "A fully operational positive train control system could've fully avoided this accident. That's what it's designed to do," National Transportation Safety Board Chairman Robert Sumwalt said. Positive train control, or PTC, can automatically slow or stop a train in case of human error to prevent accidents, like train-to-train collisions or derailments from excessive speed. The system uses GPS, radio transmission, a train's onboard computer and rail operation centers to detect if an accident is imminent. In 2008, Congress said the majority of our country's railroads had until 2015 to implement PTC systems. That deadline was later pushed back to the end of 2018, with two extra years of wiggle room mainly because of cost — an estimated $22.5 billion over 20 years. Taxpayers and individual companies have paid for the updates. So far, 59 percent of freight tracks and 68 percent of freight locomotives have met PTC requirements. Those numbers drop to 25 and 50 when looking at passenger tracks and locomotives. Despite that progress, in January the U.S. Department of Transportation released letters that Secretary Elaine Chao sent to the nation's rail network saying the department is "concerned" and that railroads need to pick up the pace to meet the mandated deadline. A congressional subcommittee for railroads plans to meet Feb. 15 to hear from several groups — including Amtrak, the NTSB and the Federal Railroad Administration — about the progress and development of PTC.